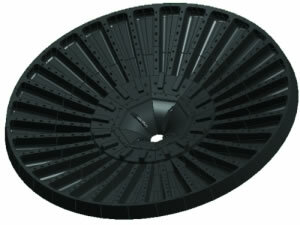 Rubber end plate can be used to increase the efficiency of grinding. On the other hand, it is able to protect mill end cover. The end plate is installed on the discharging end. Composed of metallic framework and wear-resisting rubber, rubber plate for grinder has good performance and is light. In addition, it has a simple structure, thus easy to install. The company has a first-class R&D team of fluid dynamics, mechanical design, rubber formulation and process. Besides, it has domestically leading R&D and innovation capabilities. What’s more, the company cooperates with universities and institutes to win technological supports. 1. Rubber end plate should be packaged in iron cases. Providing that the purchase orders of rubber end plate reach a certain amount, field installation and maintenance services can be offered. Jiangxi Naipu Co., Ltd. is a professional manufacturer of rubber plates for grinder. The company, at present, mainly provides rubber end plate, slurry pump, hydrocylones, and so on. Originally founded in 2005, the company has accumulated plenty of experience in customer services, such as designing, customization and installation. Besides, we also provide technical training as well to better serve clients. For details, please visit the company’s website or contact us directly.